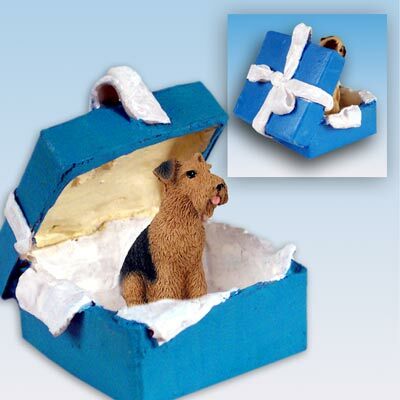 Using our Tiny Ones series of breed specific figurines we have created a wonderful surprise Gift Box ornament. Each Blue Gift box measures 1 ¾” X 1 ¾” square, and the open cover measure 2” tall. These Unique little ornaments are all hand painted stone resin and come with a silver string to hang on your Christmas tree or display on a shelf. All items are individually blister packaged, ready to give as a gift, or hang in your store. Great item for that special someone!